The Indian government has selected OTO Melara to supply 13 primary deck guns for the Shivalik-class and Kolkata-class warships, though the MoD's Defence Acquisition Council (DAC) will have to approve the selection given that it is the result of a single tender situation, as well as the fact that OTO Melara is a subsidiary company of the Finmeccanica group. The OTO Melara's 127/64 LW Vulcano gun is the weapon that has been chosen. OTO Melara is understood to have been selected after BAE Systems declined to field its 27 mm/62 calibre Mk 45 Naval Gun System. While three of the guns will be built on site by OTO Melara, the last ten will be built in India with licensed technology to a public sector enterprise. While BAE Systems is understood to have had reservations about taking on guarantees on even the license-built guns in Inida, OTO Melara has stated it is comfortable working with Indian public enterprises, especially given that its 76/62 Super Rapid Light gun has been license produced in country for years. India has formulated special rules in handling Finmeccanica and group companies going forward on active tenders. 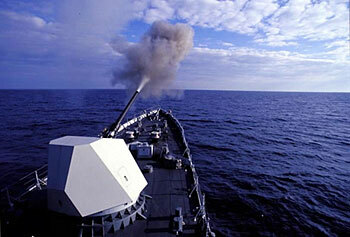 The 125mm naval deck guns have been categorised as a priority purchase, and it remains to be seen if the DAC will approve as such.